Chuck Currie is a clarinetist and saxophonist who performs with the Vancouver Island Symphony, the Pacific Symphonic Wind Ensemble, The Band of the 15th Field Regiment, Royal Canadian Artillery, Sax Noir, Pacific Blackwood, the Vancouver Saxophone Ensemble and is the proprietor of Sax Noir Studio. 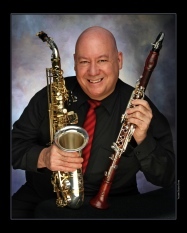 Chuck is a Backun Canada, Vandoren, Blashaus, and Conn Selmer artist performing on Backun MoBa Clarinets, Selmer Privilege Bass Clarinets, Yanagisawa Silver Sonic Saxophones and Morales-Backun bells and barrels on all clarinets. Chuck performs on Trevor James RAW Alto and Tenor saxophones. Chuck endorses Vandoren mouthpieces and reeds. He teaches at his own Sax Noir Studio, and conducts clinics and master classes throughout British Columbia. Students have auditioned successfully for the Vancouver Philharmonic Orchestra, the British Columbia Honour Orchestra, the UBC School of Music , the National Youth Band of Canada, and the International Honors Wind Symphony at Lincoln Center, New York.